The video game medium is no doubt growing, but for a (thankfully reducing) few games will always be nothing but ‘murder simulators’ or ‘sick filth’. I will always fiercely contest the idea that violent games make violent people. I have been playing for over 20 years and not once killed anyone in real life, nor have any of my games playing friends. That’s not to say that there aren’t one or two examples of un-hinged lunatics who have cited video games as being the source of their anger and the reason for their hideous crimes, but they are an infinitesimal proportion of the gaming audience at large. Even if their own claims that ‘video games made them killers’ have been disputed by recent research into the human psyche, the headline grabbing idea that games are nothing but sadistic and disgusting will not be going away anytime soon. People need a scapegoat; people need a tangible and reassuring reason why bad people do bad things. Though they may not be my cup of tea, clearly I am happy for violent games to exist for those who want to consume them. However, I am even more in favour of age restrictions. It is essential that appropriate material is only seen by appropriate eyes and this is the responsibility of those around the player and those providing the content. I’m happy for the Call of Dutys and Grand Theft Autos to be released, but not happy for my 3 year old daughter to see them. As her parent I am responsible for this. With all the age ratings on boxes and promotion that go around massive AAA releases, I have no time for parents who say it’s not their fault that “little six year old Jimmy is shooting people in the head in a murder training game”. 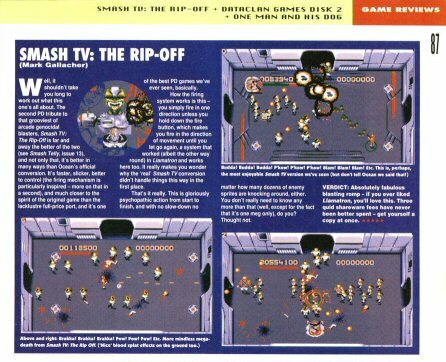 cars and even VCRs, as a reward for their non-stop rampage. Looking back at what has now become stable TV programming, the idea of a real version of Smash TV is not entirely outside the realms of possibility, in a modern world where voyeurism seems to know no bounds. 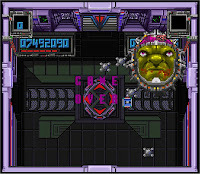 Control of this anti-hero in the original arcade game was achieved through two joysticks, one controlling movement the other the direction of fire. 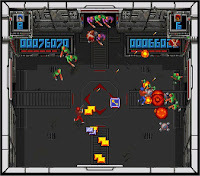 Given this, the SNES version is universally considered to be the best home port due to the joy pad’s layout; the face buttons becoming a substitute for one joystick, the direction buttons the other joystick. 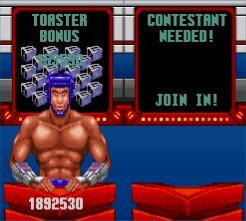 Indeed you have to wonder how possible it was to get to level 3 on the Mega Drive version, where shooting is limited to just the direction your facing. 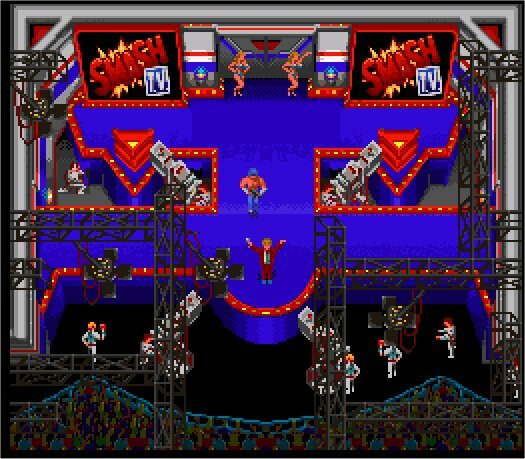 Though not an exact arcade conversion, the liberties taken with the licence in ‘Super’ Smash TV actually improve the game play. Playing it alongside the Arcade port on one of the many Acclaim collections I seem to own, actually emphasises how much better the SNES version is. 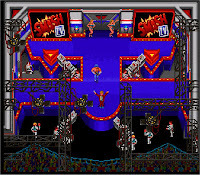 Vibrant sprites crowd the screen, with no noticeable slowdown. 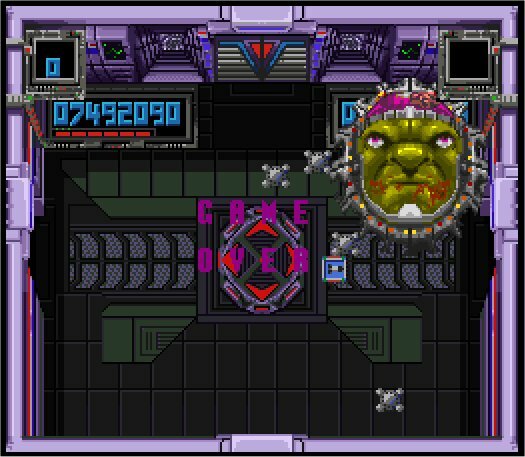 More importantly though unlike the original arcade version, getting to the ‘pleasure dome’ is actually possible in this home port, though very hard to achieve. 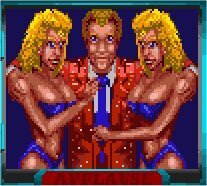 It is these sprites that actually disguise the ultra violence for a contemporary audience, and the idea of it actually offending people seems a little bit laughable now. The volume of pixelated blood and exploding 12 pixel high characters if anything seem cartoonish and tame – if i’m honest I expected it to be more shocking and gore filled. Maybe it’s because the Daily Mail was right and my years of console abuse has desensitised me to violence. More likely though is that a modern day player is used to seeing photo realism and these little exploding boxy sprites just don’t remind us of humans any more. That’s not to say I would want my 3 year old to sit and watch, but as a quick glance on the back of the box would say it’s probably fine for “aged 8 to adult”. true of the second and third bosses, where there is no safe point to wait while the required gun upgrade appeared. With the game played on Normal mode, without the cheat for extra lives I found myself dying at the same points on each play through. A predictability and inevitability of death that suggests the game is flawed rather than my abilities, as it seemed no matter how good I was there was a barrier that could not be over come without losing lives. A game is only enjoyable if it’s hard but fair, just presenting an impossible situation to a player seems rude. A product of it’s time therefore, with a plot that documents a point in time when 80’s consumerism was being replaced by 90s sensationalism. An hour long distraction, of adrenaline filled bullet dodging, unfair deaths with bombastic action hero music. It was fun to play in small doses, but got less fun each time I pressed start on the title screen. There was even times when I would get part way through the second level and just turn it off, knowing that I didn’t have enough lives to overcome the unavoidable deaths and simply wouldn’t have been able to progress. Rather than see my little all action hero unavoidably explode in a shower of red dots (over and over again), I simply saved the game the bother and turned it off. I’m sure it would have been more fun with a friend, though where enemy’s attentions are divided and boss battles halve in length. Maybe I should play it with my Mum and see how offended she really can get by pixelated blood. 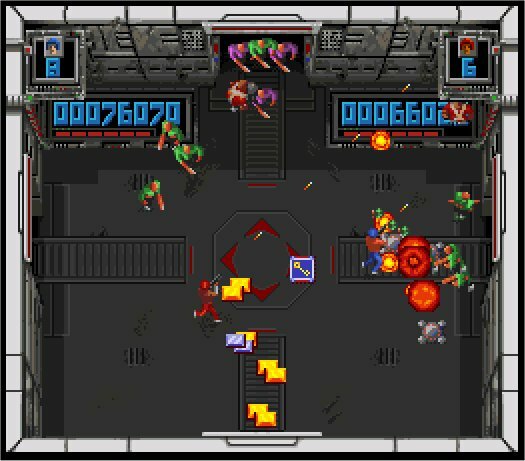 When it comes to a SNES game I definitely have a sweet spot, where if the game looks interesting I will buy it even if I don’t know much about it. 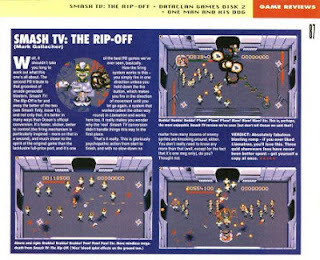 Unless it’s a sports game, if its boxed and complete without too much edge ware or crushing I’ll buy pretty much any game for £10 (+p&p) Smash TV was a somewhat impulsive eBay purchase as I saw it had just been listed for £9.99 ‘Buy it Now’ and knew it usually went for a lot more than that. Back in the day it would have been possibly three times that price – which it really isn’t worth unless you have a friend to play with.